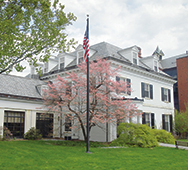 The Alumnae House of Smith College, located at 33 Elm Street, was built as a center for alumnae and college activity. The Alumnae Association had been housed at Allen Field House (present site of the Quad) and College Hall. In 1930, a member of the class of 1883 started the Building Fund, and with the generosity of the Alumnae Fund, the Alumnae Association was able to begin construction in 1937. Notable architectural features of the building include a Georgian facade, three-over-three Colonial fenestration and an entrance portico with Doric columns. Art deco motifs adorn the interior. The first floor houses the Alumnae Gallery, which presents several alumnae artwork shows each year. Today, the building accommodates more than 50 staff members comprising several offices, including the Office of Alumnae Relations, the Smith Travel program and Development, which raises funds for the college from alumnae, friends, parents, corporations and foundations.